Every communication goes through a stage of unity, even if it is not realized at that particular point in time. This is the terrain of the Greek philosopher Parmenides of Elea, who lived from around 490 – 430 BC. He argued that all existence is one, eternal and unchanging. Or, to put it shortly: What is, is. And can be nothing else. There is no existence of what is not. To imagine an empty space, either inside or outside the world destroys the unity of the One. The universe is, in his view, a plenum, in rest with itself. Plato noticed later, that Parmenides’ world had no place in which to move. Change, as a logical consequence, is only a confusion of the senses and fictitious. The appearances of motion and time are illusions. Parmenides was right from the point of view of the First Quadrant, because the ultimate unity of the First Quadrant (I) is ‘before’ anything else. There is no mentioning of the word ‘being’ in the work of Parmenides. He avoided the term ‘god’, because both entities point to preconceived ideas. The imaginable and the possible are equivalent in the First Quadrant. Parmenides’ expression that ‘what is, is’ (fragment 6) is right if we are able to position ourselves in the complete emptiness before a division. However, it is important to remember that the First Quadrant is also the only place where such a statement holds true. Because the very moment a division is introduced into the (proto) communication, nothing is the same again. From that moment on, all sense data and explanations depend on the choice of division and the valuation accordingly. Much of the critique on Parmenides, of which Aristotle in his ‘Physika’ made a strong contribution, failed to distinguish between the (hypothetical) position of an observer in a communication before and after a division had taken place. The First Quadrant (I) is the place of intuitive awareness, a walk behind the bounds of reason. We do not need an apprehension of all the complexities, because the understanding only arrives after the establishment of the limits. At this primordial phase, the communication is ambient, a keyword of the First Quadrant. Any formulation of whatever signal is received can only be a reconstruction from another quadrant, after the division-decision has been taken. This important aspect has given rise to the establishment of world religions, and many philosophers searched for new constructions in order to grasp the nature of the invisible invisibility in one way or another. The order of movement is, according to Aristotle, determined by the order of causes, which in turn depend on the place and function of each part in the whole. The telos is the expression for a superimposed movement towards the first and final cause (1). All (other) causes tend to move to and are derived from this essential state within a communication. Fig. 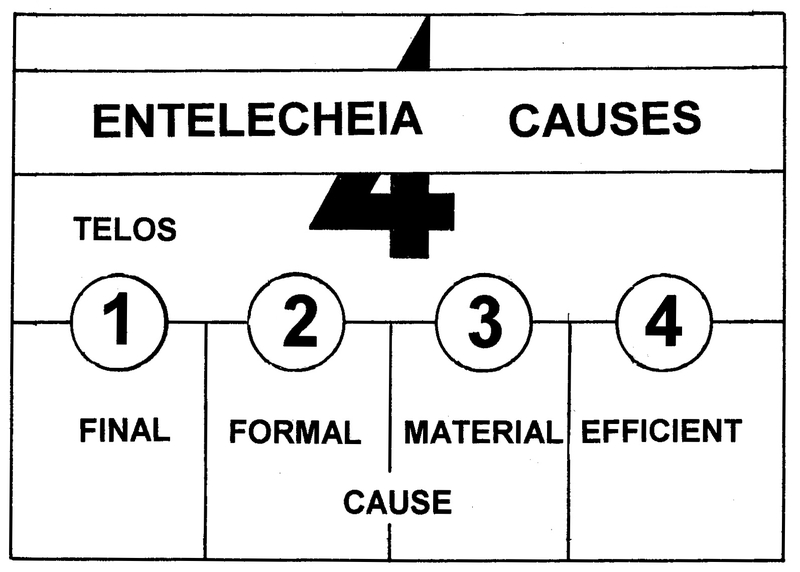 20 – The four entelechia (or causes) of Aristotle are placed here in a quadralectic setting. The interpretation points to the intrinsic nature and actual ‘character’ of a specific quadrant. The words energeia and entelecheia, which were coined by Aristotle, did not exist before his time (BLAIR, 1967). They are both related to the ‘act’ in the theory of potency (and therefore directly relevant to the First Quadrant of the quadralectic philosophy). Aristotle was the first one to ‘see’ them and needed a neologism to describe them. He used the term energeia five times more than the term enteleichia, the latter in particular in Book III and IV of the ‘Physics’ and ‘De Anima’. Energeia points to the actual act (to do) without a reference to change. It has to be positioned in a ‘First Quadrant’ (I), in the static and fundamental part of the invisible invisibility. Motion and subsequent transition do not belong here. Entelecheia has the meaning of ‘to be at an end’ or ‘to complete’. As such it has a richer flavor than the energeia. The field is more open, there is a view (with an end). The conception has to be placed in ‘first quarter’ of the Second Quadrant (II, 1), with its own dynamism and realization of division. The philosopher Immanuel Kant (1724 – 1804), doggedly in search of the roots of understanding, called the first state of experience the unity of apperception. He pointed in his book ‘Kritik der reinen Vernunft’ (Critique of Pure Reason, 1781) – an unequaled study of the basic conditions and boundaries of human experience, but not recommended for light reading – to the ‘a priori’ character of cognition. By doing so, Kant paved the way to the intuitive character of the First Quadrant (in contrast to the rationalistic arguments of the Third Quadrant). He saw the ‘all’ as a preliminary step towards finding out what is (HINTON, 1904). 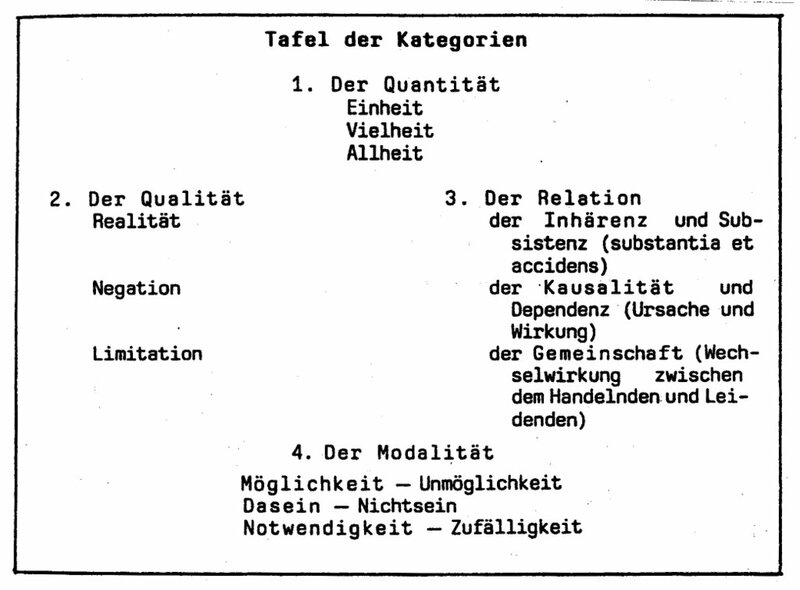 Kant insisted – in his ‘Kritik der Urteilskraft’ (Critique of Judgment, 1790) – that a study of the categories of mechanistic causality, which was used in the nonliving reality, could do no justice to the activities of the living realm. Human judgment was forced, in his view, to postulate an additional principle of teleological causality which Kant called ‘natural purpose’ (Naturzwecke). This ‘natural purpose’ was just a rebirth of the first quarter of the old Aristotelian entelechia tetrad. Then – within a familiar oppositional framework – the teleological judgment (of a ‘godly’ nature) was placed against an aesthetic judgment (of ‘human’ proportions). To understand such a duality it helped a great deal if the division framework – just as in Aristotle’s case – was extended to a higher type of division-thinking (like the four-fold variety). Johann Wolfgang von Goethe (1749 – 1832) was probably the most prominent of the early thinkers, who picked up this dynamic duality and used it as an antidote to the fragmentation of Newton’s universe. He saw the one-division as a distinct option: ‘A living being takes part in the Infinite (the all-encompassing Whole) and has something of infinity within itself’. His aesthetic-teleological vision of living nature became a fertile ground for later thinkers and scientists, who had an inkling of wider forms of division thinking and wanted to escape the tight bonds of the causal-mechanistic model of understanding. When Kant died in 1804, the European consciousness was ready to throw off the oppressive bonds of oppositional (or dialectic) thinking and could accept a wider frame of mind. If Ramon Lull, in the early thirteenth century, was the first of the dualistic philosophers, than Immanuel Kant, some six hundred years later, was the last one. The new era of understanding – and the booming of the scientific research – started when the insight dawned that the a priori element of reasoning – which still has a ring of a duality between ‘before and after’ – should be extended to the ambient. This small change in gradation is, in hindsight, an intellectual eye-opener of gigantic proportions. Kant’s breakthrough to higher division thinking was the notion that any rational investigation must be based on the hypothesis of a random consciousness. In other words: there should be a distinct place without limits within the rationalistic cognitive framework. This assumption was fully understood by Charles Darwin, who applied the principle of randomness to the origin of species. He assumed an indefinite variability within the narrow limits of consecutive variations. The leading principle, however, was the supposition that any structure or organized being possessed features of permanence. These postulates, the Kantian unity of apperception and the Darwinian features of permanence, were the important outcome of the new understanding. The great intellectual development of the nineteenth century in Europe became only possible after the creation of a conceptual space to accommodate the unlimited. Contemporaneity and infinity are two distinct characteristics of the First Quadrant. The first concept points to a situation in which the division of time is eliminated (for the time being). The second state (infinity) has abandoned the influence of both the divisions of time and place. This state of non-division is hard to imagine, because our imagination is geared to think in terms of separation and division in order to ‘see’ and make it substantial. The world seems an empty place without subject matter. The various vistas with regard to the status of the First Quadrant should be distinguished clearly. An observation (by an arbitrary observer) is always situated in a particular environment, which belongs to a chosen division. Any statement of the observer reflects that position. The name ‘First Quadrant’ is, in this respect, much clearer than many of its predecessors like monad, absolute, holon, enigma or rhizome. They aim at unity, but do not state their division environment. The description of Unity in a four-division setting implies that the observer disposes of four positions to look at the ultimate limitation. A position in the First Quadrant (I, before any division) is fundamentally different from a location in the Second Quadrant (II, after a division is established). This latter position is, in turn, different from the ‘empirical’ view of the Third Quadrant (III). The Third Quadrant gives a temporary solution to limitation of the Unity in a binary framework. The Fourth Quadrant is different again. The insight dawns here that Unity is a form of expression, which leads to a precursory state of undividedness. The position of an observer towards the unity of the First Quadrant is now looked at in more detail. A historical advocate of each example is given.